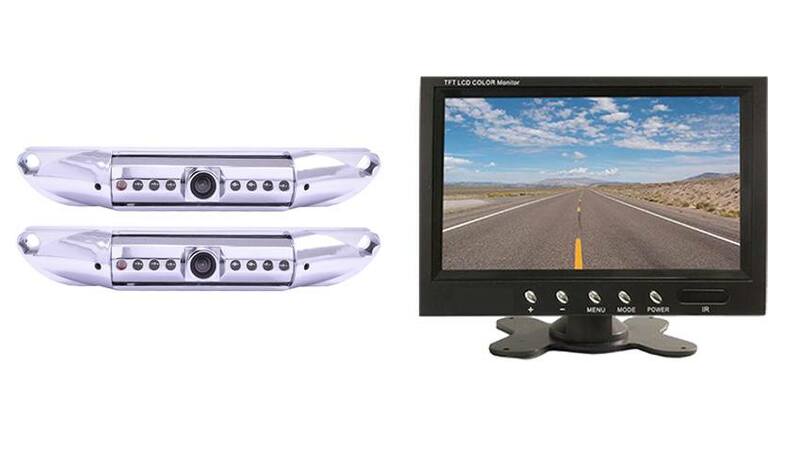 By using the “CUSTOMIZE AND UPGRADE” section at the top right of the page, you can choose which style of backup camera fits your needs and budget. This system comes preconfigured with 2 cameras however, we have different styles for all kinds of uses. Change 1, both or none of the cameras in this system, the choice is yours.Please use this guide to help you select which camera is best for you. The License Plate rearview camera is mounted by screwing your current license plate screws through its brackets, it’s a very simple installation. The camera can also be adjusted by angling the camera up or down so you can get the perfect view for your car. The CCD lens is the clearest and highest quality camera TadiBrothers sells, also known as an HD Backup Camera. There is no need to drill any holes or install mounting brackets. The camera has a 120° angle which is best for Cars, SUVs, and Trucks. With 120° everything behind the vehicle can easily be seen, it is also color, waterproof and has military grade night vision. The camera and mount are made of steel for ultimate durability in the roughest weather conditions. This item includes a 15 Foot cable, if its going on an RV, BUSor any other vehicle longer than average SUV we recommend upgrading to our premium extension cables located on the top right of the page.